Demandforce is well-known as an online reputation management system, but its main value added is in its ability to help with patient recall and reactivation. Demandforce is a powerful marketing and patient communication system designed to increase patient recall and reactivation. This is Demandforce's core business, but many businesses are attracted to the system because of its ability to solicit reviews from patients. Although this is a nice perk, it isn't the only reason to pay for the software. $299 one-time setup fee (often waived). Is Demandforce the right software for you? Demandforce is used by more than 30,000 businesses to increase patient recall, improve staff efficiency, and manage their online reputation. The company was founded in 2003, and acquired by Intuit in 2012 for $423.5 million. In 2016, Intuit sold Demandforce to Internet Brands. Demandforce is used across a variety of industries, but is especially popular among dental and medical practices. The patient communication system integrates directly with many popular practice management systems, and syncs with them frequently in order to make sure that both systems are working off of the same set of data. Because these systems are integrated, this avoids a lot of the problems that typically arise when managing multiple disparate software systems. We'll discuss some of the key features of Demandforce, and how they can benefit your business. This is Demandforce's core business, and where a lot of its value lies. By syncing with your practice management system, Demandforce is able to identify patients who require outreach -- either because they are overdue for appointments, or because they have scheduled appointments and need reminders. The system can extract each patient's email and phone number from the practice management software, and automatically send an email or text message to communicate with the patient. Automating patient communication means that your staff will have more time to focus on other tasks that need their attention, instead of manually calling patients and following up with them on a regular schedule. Demandforce developed "Fast Sync Technology" to make sure that the system stays in sync with your practice management software. This is important in order to make sure that Demandforce doesn't mistakenly send a reminder to a patient who cancelled his/her appointment in the practice management system. Similarly, upon contacting a patient, Demandforce will notify the practice management system if the patient confirmed or cancelled the appointment, so that it can be updated in the PMS accordingly. In addition to reducing no-shows with patient reminders, Demandforce also helps build upon your existing business through marketing efforts. You can use Demandforce to launch marketing campaigns and send email newsletters to connect with different segments on a regular basis. For example, you can create a campaign to get more people into your office for Invisalign by offering a discount. Many customers like that Demandforce helps them solicit reviews, which they can display on their websites. Demandforce also helps increase your web presence, because Demandforce reviews will show up whenever prospective customers search for your business online. However, Demandforce reviews aren't posted on Yelp or Google. It's not uncommon for a Demandforce customer to have hundreds of reviews on Demandforce, but very few Yelp reviews. 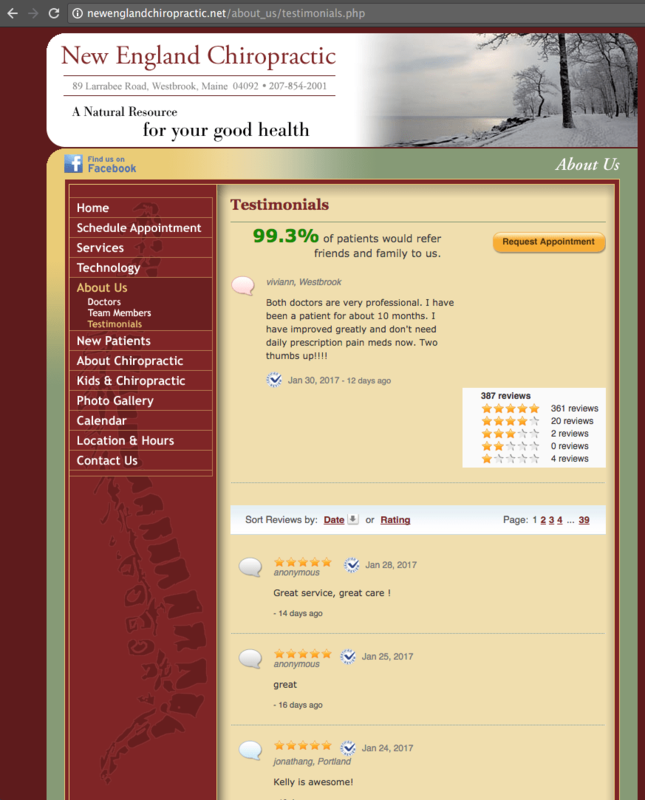 Here's an example of a business with 1100+ reviews on Demandforce, but only 6 reviews on Yelp and 46 reviews on Google. For this reason, we would still encourage Demandforce customers to ask their patients for reviews on other sites as well. From the perspective of a potential customer, the Demandforce reviews are generally less valuable, since Demandforce Local doesn't have as much name recognition as more reputable review sites, like Google or Yelp. Another issue is that if you want to switch to a different system, you may lose access to your patient reviews. The way that Demandforce enables you to display reviews on their site is by providing you a widget that you can put on your site, and queries their servers to get the most up-to-date reviews. While this is convenient when you're a Demandforce customer, it can make it difficult to transition to another system. If you embed these reviews in your site through the widget, and later decide to stop using Demandforce, then the widget will break. Though the patient reviews are yours, you will have to back them up so that you can continue to display them after you end your relationship with Demandforce. However, if your reviews are posted to Yelp, then this is a non-issue. In order to ensure that you maintain your online reputation regardless of whether you continue to use Demandforce or not, you should make sure to back up your Demandforce reviews on a regular basis. 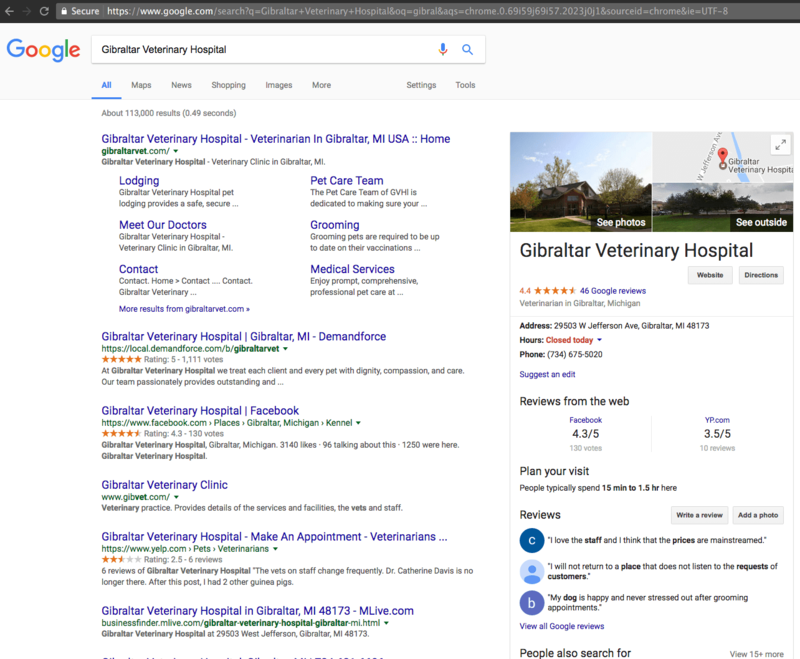 Instead of relying entirely on Demandforce to solicit reviews, you also need to be proactive about asking your patients to submit reviews on other reputable sites like Yelp. Another benefit of using Demandforce is that you will be able to gain exposure to potential customers through Demandforce Local, a directory of businesses, organized by location and industry. 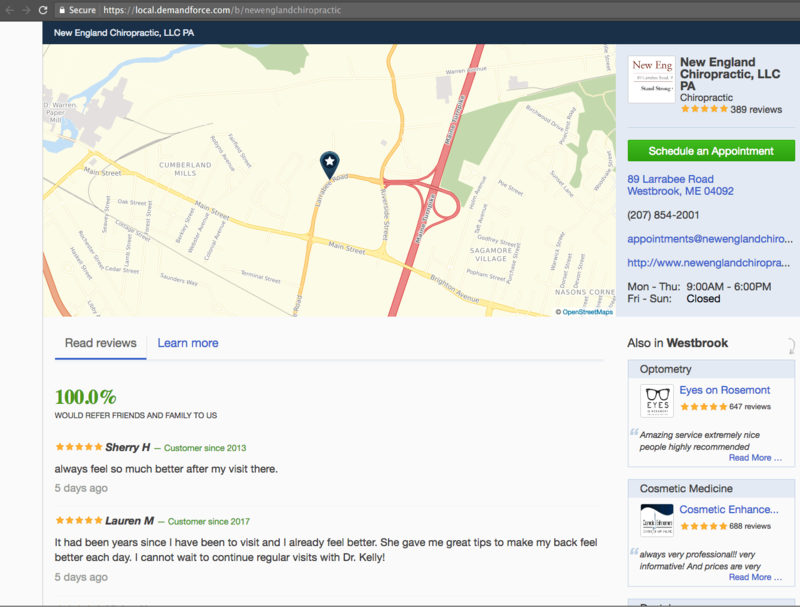 Users can search for businesses in your area through local.demandforce.com, learn more about your business, read other customers' reviews, and request an appointment. Users may visit Demandforce Local to search for businesses, but they can also come across your business profile when they're browsing or reviewing other businesses (for example, see the "also in Westbrook" sidebar in the screenshot below). Though Demandforce can be worth its price tag (approximately $300/month), it would be a mistake to purchase it just for its ability to solicit reviews. Although these online reputation management features are a nice perk, much of the software's real value lies in its patient recall features and appointment reminders. These capabilities can justify the cost by helping you increase revenue and build patient loyalty. However, you will want to make sure that Demandforce will be able to integrate with your existing practice management software, otherwise it could introduce a new set of headaches. Many practice management systems offer automatic appointment reminders as an add-on module, for a fraction of the cost. Therefore, even though Demandforce can be an excellent investment, we would also suggest evaluating whether or not your current practice management system's patient communication functionality will be able to satisfy your needs, even if it's less robust than Demandforce.